I’m running into an intermittent bug that I can’t reproduce in a small patch, it only appears in my large show patch with many textures, renderers and texturefx. The strange thing is I can fix it if I put a renderer/DX9Texture upstream, open the renderer with the inspector, and randomly change some options. Literally sometimes if I change anti-aliasing it works, sometimes if I change texture format it works. 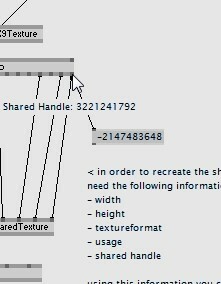 My best guess is it’s an out of range error on the handle pin data type, either on the Info or Sharedtexture. And by changing those options it generates a new handle which eventually is in range. @joreg, just be sure, have you fixed it on x64 too? I have noticed the same behavior on x64. As well as the handle flickering between two values. This I when using videoin and videotexture. @sunep that specific one was an x86 only bug. if you have an x64 one to reproduce please start a new thread. i am not aware of any. the handle flickering with videotexture is by design and not a bug. of course the image should not flicker.